I recently visited the Bayan Wild Hot Springs in Yangmingshan (八煙野溪溫泉), one of the most interesting natural attractions I’ve been to in Taiwan. Taiwan is of course rightly famous for its hot springs, but sadly, most of the areas that boast hot springs have been commercialized. 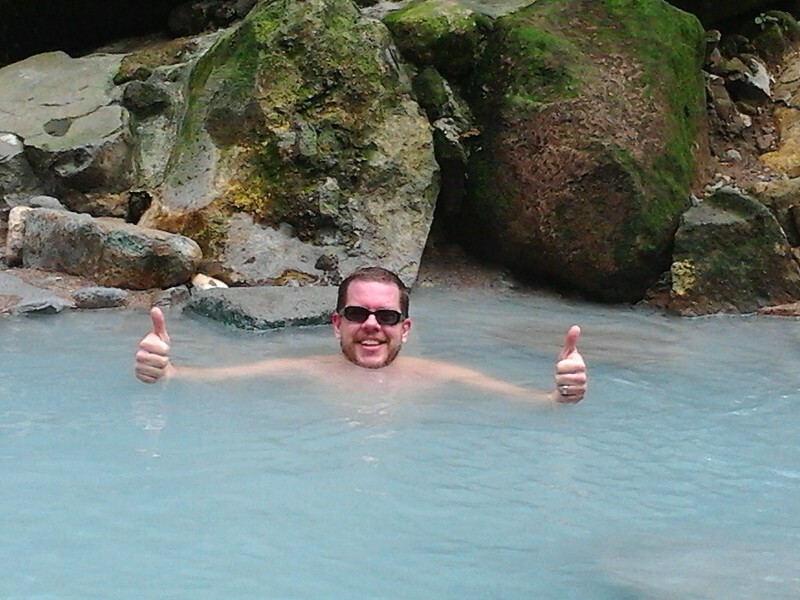 In Taiwan, going for a soak is big business! 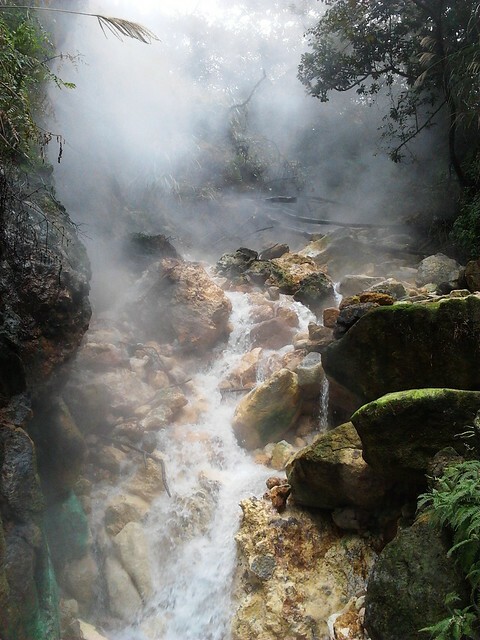 Fortunately, Bayan Wild Hot Springs has not fallen victim to this fate, saved by its location within Yangmingshan National Park, and the fact that it’s not easily accessible to the masses. Not easily accessible doesn’t mean inaccessible, however, so I made the trek out to find it. The most convenient way to get there is by car or scooter (provided your scooter is up to a mountain excursion), but public transportation is also an option. Take a bus (No.1717) from Taipei Main Station, just outside the M8 Exit, directly across from McDonald’s. The bus takes you to the Bayan Hot Springs Resort. Once you’re on the main road outside the Bayan Hot Springs Resort, take the road towards the resort, and before you enter you’ll see the trail head, with a small area where you can park a car, and a (non-working) outhouse. From there, go down the trail and start walking alongside the river, heading upstream. At one point you’ll have to navigate a small stream, and you will have to remove your shoes to cross. (Best if you just wear Tevas, or something similar). Apparently there was once a small footbridge, but it has been washed away. After you’ve crossed the stream, follow the trail uphill. You’ll see a warning sign threatening trespassers with a NT$15,000 fine, but according to the locals, that’s there to protect the park from lawsuits in case of injury. Continue past the sign and you’re there! Once you’re there, you’ll notice a steaming waterfall on your right. This is the source of the hot water. 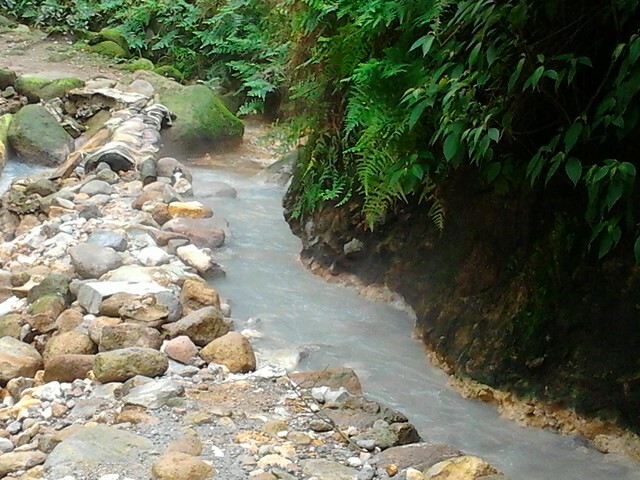 These are sulphur hot springs, so there is that “rotten egg” smell in the air. I like it, but I’m sure my response is Pavlovian – I associate it with relaxing in a hot pool of water. Yup, it’s hot! I didn’t actually dare to stick my toe in the water for even a second – just the occasional splash from the rapids made me yelp. 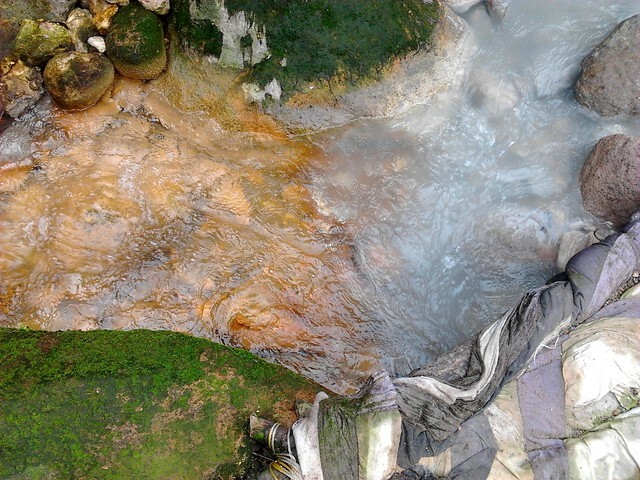 ….it mixes with fresh, cool, stream water from an adjacent waterfall. Ghostbusters advises us to never cross streams, but here it’s a good thing. 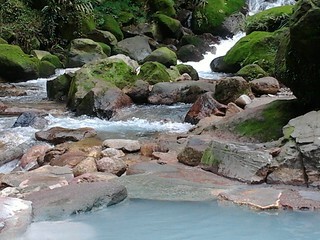 Without that cool water added, the hot springs would be too hot to enjoy. It’s not exactly a kid-friendly hike to get there, and crossing the stream can be a challenge on one’s own, never mind bringing a child, but it’s not that difficult, and I know my daughter really enjoyed herself. (Bring some bath toys so they don’t get bored!) The water isn’t very deep, especially in the not-quite-so-hot pools, which is where they’ll probably be spending most of their time, so you don’t have to worry about them drowning. Try to remember that most people are there to relax, so don’t bring your kids if they’re going to be running around making a lot of noise. As long as you’re willing to supervise them, it shouldn’t be a problem, though. And it isn’t suitable at all for dogs, so leave yours at home! There’s a tarp strung up at one end of the area where you can do a quick clothes change if needed, so you don’t have to hike up to the hot springs in your swim trunks. It’s also a good idea to bring some food and drink with you. Soaking is hard work! Of course remember to bring all your garbage out with you when you leave, right? 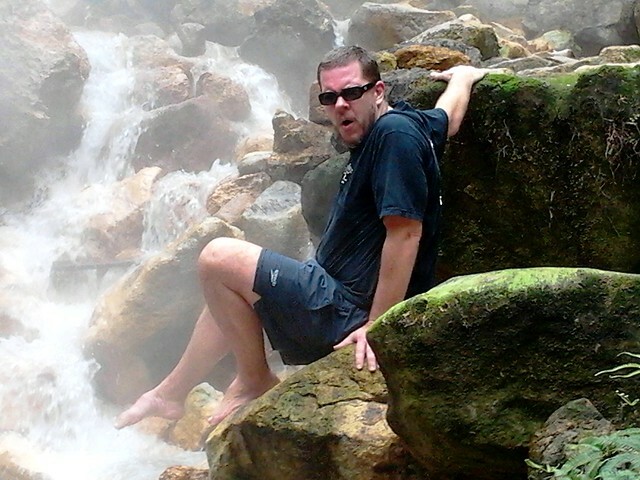 Other things that annoy me are people who shampoo in the hot springs. Granted, the flow of the water takes it away fairly quickly, but still…. it’s like people who clip toe nails in public. It’s gross. Or maybe I’m just too uptight? I like to bring a cold beer or two with me when I go, but I try to be respectful of those around me and keep things low-key. On weekends with good weather, there will be a lot of people there. Save your visit for a weekday, with lousy weather. But don’t go in heavy rain. Not only will the stream you have to cross to get there be almost unnavigable, there is a danger of flash floods and falling rocks in heavy rain. Finally, remember that despite the large numbers of Taiwanese people that visit, it’s not technically permitted. Because of the difficulty in getting there, when people have gotten hurt in the past (and there have been some incidents), rescue is always very costly, and takes a long time. If a police officer or a park official shows up when you’re there, he’ll probably ask everyone to leave. This is bad luck, but there’s no way around it. Be respectful, gather up your things, and head back. It’s a pity when it happens, but as long as people heed the requests to leave, it’s doubtful anyone will ever get hit with the possible $15,000 fine that’s posted at the entrance to the path. 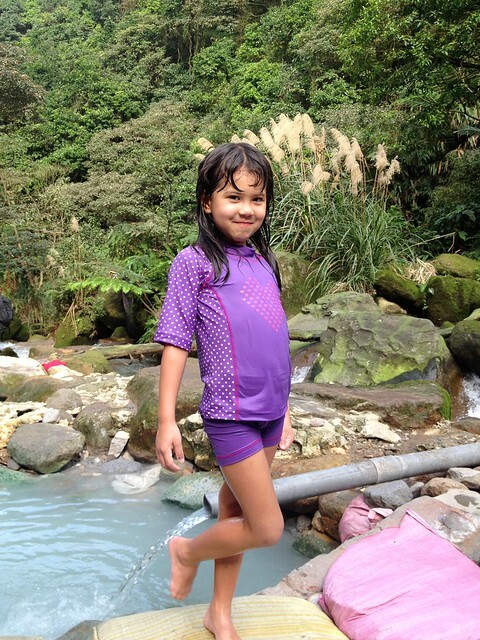 Click here for the Bayan Wild Hot Springs listing in the Taiwanease Directory.